Try us and you'll be convinced! Our recipes are authentic and time-tested. The ingredients are always fresh. The result? A menu that bursts with flavor. Stop in the next time you're in the neighborhood and enjoy an old favorite. Or, discover a new one. Either way, we'll treat you to a dining experience that's unparalleled. Just had a delicious salad and pizza. My salad had at least 3 tomatoes cut up on it. The pizza was great lots of toppings authentic Italian cuisine. 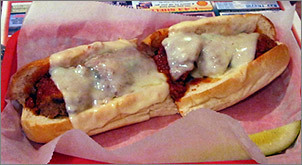 I went for lunch at Luigi's, which is located in Bellevue on the far east side of Green Bay. 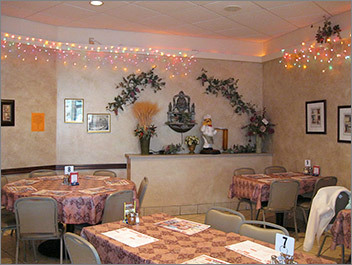 Luigi's restaurant is owned and run by an Italian family and the food is personally prepared by them. When I entered the restaurant the server/owner was not very friendly, no smiles, just asked if I was here for lunch and sat me at a table with a menu. The restaurant was immaculate and the interior was decorated in a charming style with professional hand painted murals on the walls, wine racks, and pictures of Italy that also adorned the walls; there are no booths, but there are plenty of tables for seating. The restaurant is deceivingly large. In the background Dean Martin was crooning out some Italian songs. The menu is a combination of American and Italian fare and they also serve a variety of beer and wines. To start out I ordered the garden salad for $4.45 with Giovanni's Italian vinaigrette and the meatball sandwich for $6.25 which consisted of three large homemade meatballs with pomodoro sauce topped and baked with Mozzarella cheese on a bun. Throughout my meal my server was very efficient in seeing that I had everything, but she was serious and not very personable; I even tried to initiate a small conversation about Italy where she and her husband are from but I did not get much of a response, she just kept a very dead pan expression. My salad was large and very fresh, it consisted of field greens, shredded carrots, shredded cheddar cheese, and thick tomato slices. 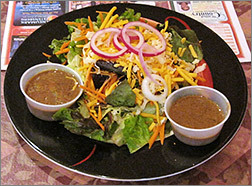 The vinaigrette dressing was wonderful; it was a smooth and well made dressing with good quality balsamic vinegar. My meatballs were delicious and definitely made from scratch. The blending of the seasonings had a nice balance without an overpowering garlic flavor. The pomodoro sauce had a pleasing texture and consistency, not too thin or too thick with a fresh flavor. The bun that the meatballs were placed on was mediocre in taste. Towards the end of the meal I finally did get a tiny smile from my server. I asked her if her husband made the meatballs and what the recipe was; she smiled and said yes he did make them but the recipe is a family secret. In case you plan on dining at Luigi's they will be closed July 4 through July 22 for they will be vacationing and visiting family in Sicily.